Twenty-First Century Science Fiction is an enormous anthology of short stories—close to 250,000 words—edited by two of the most prestigious and award-winning editors in the SF field and featuring recent stories from some of science fiction's greatest up-and-coming authors. David Hartwell and Patrick Nielsen Hayden have long been recognized as two of the most skilled and trusted arbiters of the field, but Twenty-First Century Science Fiction presents fans' first opportunities to see what their considerable talents come up with together, and also to get a unique perspective on what's coming next in the science fiction field. 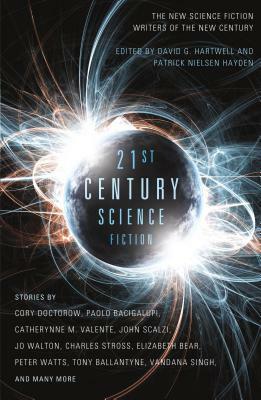 The anthology includes authors ranging from bestselling and established favorites to incandescent new talents including Paolo Bacigalupi, Cory Doctorow, Catherynne M. Valente, John Scalzi, Jo Walton, Charles Stross, Elizabeth Bear, and Peter Watts, and the stories selected include winners and nominees of all of the science fiction field's major awards. David G. Hartwell, called "an editor extraordinaire" by Publishers Weekly, is one of science fiction's most experienced and influential editors. As an editor with Berkley Books, Pocket Books, William Morrow, and Tor Books, he has worked with many of the field's best authors and edited many award-winning works. He is the author of Age of Wonders, a nonfiction study of the science fiction field. Among his many anthologies are the bestselling World Treasury of Science Fiction and the World Fantasy Award winner The Dark Descent. He is the holder of a Ph.D. in comparative literature from Columbia University, a winner of the Eaton Award, and has won three Hugo Awards for his editorial work. Patrick Nielsen Hayden, called by the Washington Post "one of the most literate and historically aware editors in science fiction," is the winner of three Hugo Awards and the World Fantasy Award for his editorial work?. He is the editor or co-editor of several original and reprint anthologies, including the Starlight series and the young adult anthologies New Magics and New Skies. ?As an editor at Tor Books for over 25 years, he is responsible for publishing the debut novels of many of the field's best writers, including Maureen F. McHugh, Susan Palwick, Cory Doctorow, Jo Walton, and John Scalzi.